From The New York Times: “Increasingly, patients, advocates and doctors believe [psychiatric advance] directives (called PADs) could help transform the mental health system by allowing patients to shape their care even when they lose touch with reality. Hospitals must put them in patients’ medical records and doctors are expected to follow them unless they document that specific preferences aren’t in the patients’ best medical interest. ‘PADs could be a very important tool to minimize hospitalization and minimize involuntary commitment,’ said Cherene Allen-Caraco, chief executive officer of Promise Resource Network, a peer-counseling organization in Charlotte. By letting patients give permission beforehand to be committed to hospitals they prefer, the directives can avoid the arduous court-ordered commitment process — traumatic for patients, especially if they’re handcuffed by police. In other words, psychiatrists always do what they want. This will, however, give patients the opportunity to sue the hospital if the procedure is not followed, but hardly anyone will, because it is very hard. 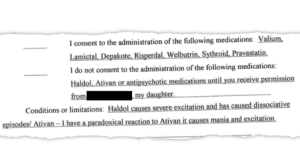 This is typical fake news designed to convince readers that only people severely ‘overwhelmed with hallucinations and voices’ have their rights violated by psychiatry. The comment section was closed, “Comments are moderated for civility.” My guess is they could not censor out the psychiatric abuse stories as fast as they were piling up. I have a psychiatric directive in my legal documents but after reading this article I need to do more to protect myself. Scary article essentially write what you like it will be ignored… as the doctors and vice presidents know best at all times.. they know the best drugs and best restraint and seclusion. fake news is 100% correct.. another nami piece of marketing pad short for patients are dumb….